Maldives.com was among the signatories at Male’s Hotel Jen last night as partners for the MATATO Maldives Travel Awards 2016 were officially announced. 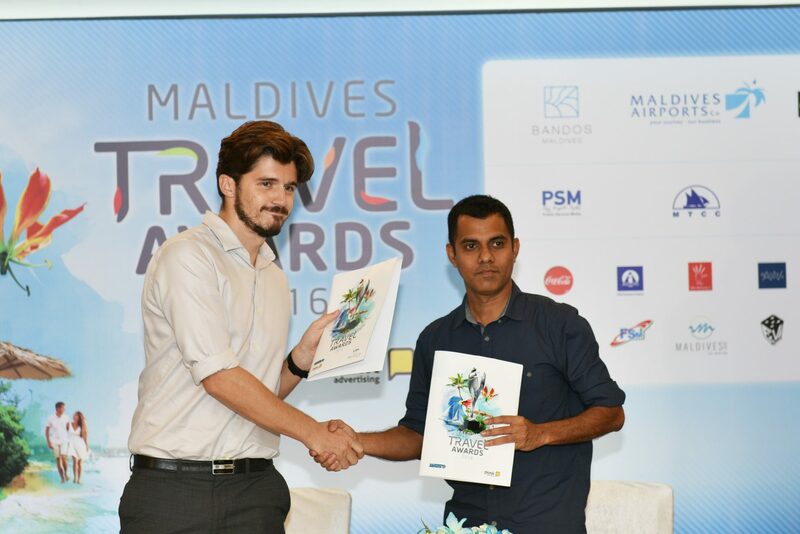 Acting as associate partner for the 5th edition of the Maldives’ most prestigious travel awards ceremony, Maldives.com was represented by Daniel Bosley, who signed the agreement with Adheel Ismail, CEO of Think Advertising, the current event organisers. Also signing at the event were Maldives Airports Company Ltd, Dhiraagu, Etihad Airways, Male Aerated Water Company, MV Hotels, Getaways Maldives, Bandos Maldives, Allied Insurance, Mihaaru, FSM, Public Service Media, Popjoy, and Maldives.net.mv. Local band Equatic Vibe will provide the official song for this year’s awards, while the event for the final gala event is yet to be announced. The 2016 edition will feature an extensive awards list, with 35 prizes to be won. Award categories cover resorts, hotels and guesthouses, liveaboards/diving/watersports, and transportation & technology. New categories for this year’s event include ‘Leading Travel Website’, ‘Leading Guest House Island’, ‘Leading Innovation in Guest-House Design’, ‘Leading F&B Outlet’, and ‘Leading Airport Lounge’. The travel awards are open to any company working within the sector, with last year’s winners automatically entered to compete this year. Big winners in 2015 included Bandos Island Resort (‘Best Dive Resort’ and ‘Most Supportive Resort’), PER AQUUM resorts (‘Most Romantic Resort’ – Per Aquum Huvafenfushi; ‘Leading F & B Resort’ – Per Aquum Niyama), and Anantara resorts (‘Leading Beach Resort in the Maldives’ – Anantara Kihavah Villas; ‘Leading Wellness and Spa Resort’ – Anantara Veli Resort; ‘Leading Spa Brand’ – Anantara Spa; ‘Leading International Hotel & Resort Brand’). Nominations for the event were closed earlier this month. The awards, launched in 2011 to recognise and celebrate the leading lights in the Maldives’ famed tourism industry, going international in 2015 as the final event took place in Dubai. Main Sponsor: Maldives Airports Company Limited is the Main Sponsor for this year’s edition of the Awards. This is the 5th year running that the nation’s international airport – the gateway for the travel industry – is being part of this prestigious award label. Conference Host: Bandos Maldives – being one of the pioneers in the travel industry with years of experience in hosting conferences and meetings – as the Conference Host provides a historical venue for the Industry Conference of Maldives Travel Awards. Official Media Partner: Public Service Media is the Official Media Partner for the 5th time since the Awards began in 2012. Official Hotel Partner: Hotel Jen by Shangril-La is the Official Hotel Partner for the awards and will host the functions to be held in the Capital City. International Airline Partner: Etihad Airways, the fastest growing airline in the history of commercial aviation, is the Official Airline Partner of the event. Silver Sponsor: Allied Insurance Company of the Maldives Pvt Ltd joins the award label as a prestigious Silver Sponsor. Silver Sponsor: Fuel Supplies Maldives also joins as a Silver Sponsor providing an enormous and crucial element in fueling the industry with their years of service. Telecommunications Partner: Dhiraagu, the largest telecom operator in the country is the Telecommunications Partner.